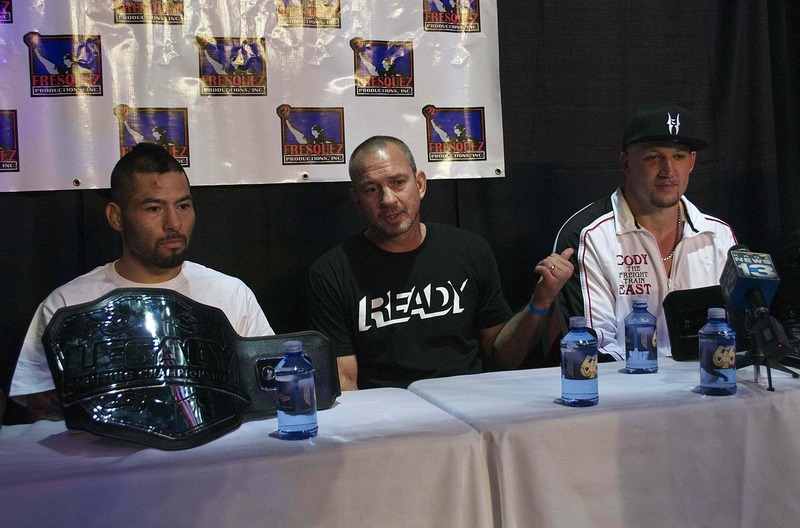 It took the crowd of about 1,000 Friday night inside the Route 66 Casino just outside of Albuquerque, New Mexico a while to get warmed up to the action from Legacy Fighting Championships 36 two-title fight card. 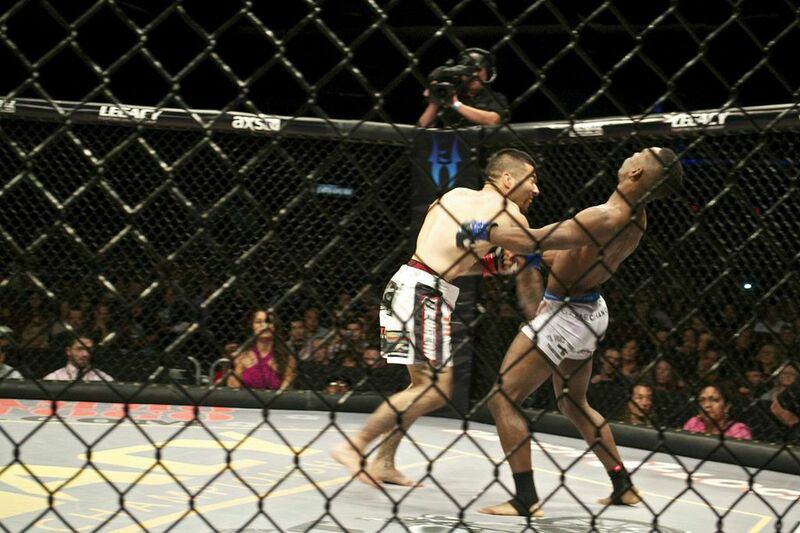 The igniter was a huge over the top right-hand delivered by Albuquerque’s Damacio Page in the first round of his Legacy Flyweight championship co-main event bout against Brian Hall. The thundering blow, set up by a double feint left jab came at the 01:48 mark, knocked Hall out cold sending him flat on his back and launching the hometown fans into a frenzy. Not even AXS TV’s play-by-play commentator Michael Schiavello’s notable “Good night, Irene!” call could be heard from just feet away. At any given time I can knock anyone out,” said Page who has found a new life by taking his power down from bantamweight to the flyweight division a move that might allow him back to the UFC. “Hopefully [UFC matchmakers] Joe Silva or Sean Shelby gives me a call,” said Page. “I think he’s back in the UFC, he hits harder than anyone in that division,” said Page’s striking coach Mike Winkeljohn. In the main event of the evening Albuquerque’s Cody East had little trouble displaying slick boxing against the apathetic Vernon Lewis. Despite having some moments when he was successful with single strikes, Lewis was reluctant to take the initiative and paid for it as East showed no pity. 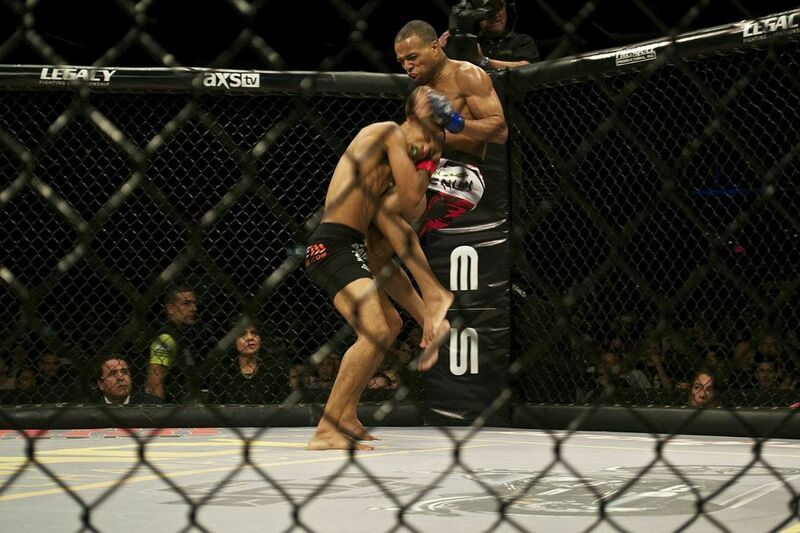 Throwing a straight leg kick into Lewis‘ stomach as the Texan rested against the cage, East would then follow up with a 22-punch, tactically placed boxing barrage which included a knee at halfway through the attack which was finally capitalized with two hard right crosses forcing referee Raul Porrata to stop the action at 03:26 of the first round. With the win East improves his record to nine wins and one loss and by claiming another promotional title boosts résumé to attract the attention of the UFC. “If they want me to defend [the Legacy Heavyweight title] I’ll defend it, if the UFC wants me I’m ready,” said East. After an uptempo competitive first round Albuquerque’s Donald Sanchez would rely on technique, picking shots and combining punch-kick combinations, often coming from the same side to outpoint Charles Cheeks III. 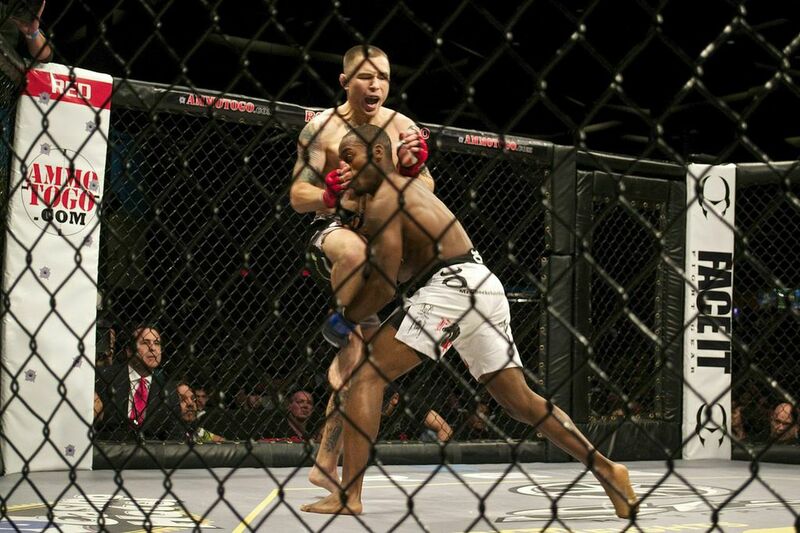 Cheeks’ confidence seemed to deteriorate as the bout continued having several takedown attacks stuffed or sprawled out of Donald Sanchez. Add this two slick trip takedowns and leg drags and it was a frustrating evening to the visiting fighter. The 30-27, 30-27, 29-28 unanimous decision victory marks Sanchez’s first since moving to the Jackson’s-Winkeljohn’s MMA gym. on the feet gave the technically gifted Espinosa the edge in the first. Both men came out in the second very technical. de Freitas would mix in kicks to the body and legs. Espinosa would continue to picks shots via effective countering punching. Toward the latter part of the round the pendulum would appear to swing in Barata’s favor who finally forced a takedown. After a series of failed ankle lock attempts he would switch to a calf slicer but would ultimately resort to rear-naked choke as the round would end. The final round would be controlled by de Freitas who would win an takedown early on –albeit at a cost against the cage, taking huge elbows to the side of the head. In one series de Freitas would mount Espinosa and drop five consecutive right hands. With both men low on fuel de Freitas would have the opening for an arm triangle, a hold which he kept for what appeared to be the last two minutes of the fight. Espinosa’s half a dozen thumbs-ups to the referee signaled that he was never really in danger of being submitted. Fearing that the referee would stand the men up de Freitas would land some short punches to Espinosa’s ribs. The bout would come to an end. For press row it was a foregone conclusion that de Freitas had taken the last two rounds, they were mistaken. The scorecards read 29-28, 29-28, 29-28 all in favor of Espinosa, a four and a half to one underdog at the start of the match. The nearly eight to one favorite de Freitas would crouch in disbelief. In the other main card bouts Albuquerque’s Lenny Lovato Jr. coming into the bout out of shape was stopped by Albuquerque-based Clint Roberts in the first round and formerly Jackson’s-Winkeljohn’s MMA trained Norma Rueda Center pulled off the upset against eight-time brazillian jiu jitsu world champion and previously unbeaten Michelle Nicolini.